On Monday, January 20th, Hasbro unleashed the new, N-Strike Elite Demolisher in advance of the London Toy Fair. Since then, a number of new details on this unique blaster have emerged, due in no small part to the folks over at UK Nerf providing us with hands-on feedback before the show closed. We thought this would be an appropriate time, then, to collect all of the best intel we have been able to find on what is sure to be one of 2014’s hottest products. New, banana-style clip will add a touch of mil-sim to this blaster, but will only carry 10 rounds. Apparently, part of the curved section in the bottom is empty space. Current prototype houses 4, “AA” batteries according to Hasbro PR, and the battery compartment closely very resembles the 3-battery Stockade or the 4-battery Rayven. Firing is currently being described as “semi-auto,” versus a full-auto model like the Rapidstrike, which uses higher amperage “C” cells (while all dry cell batteries have a nominal voltage of 1.5 volts DC, amperage is similar to how much water flows through a hose versus voltage being similar to pressure—a full-auto blaster would need a larger flow rate, essentially). An unconfirmed rumor suggests the final version could be full-auto. 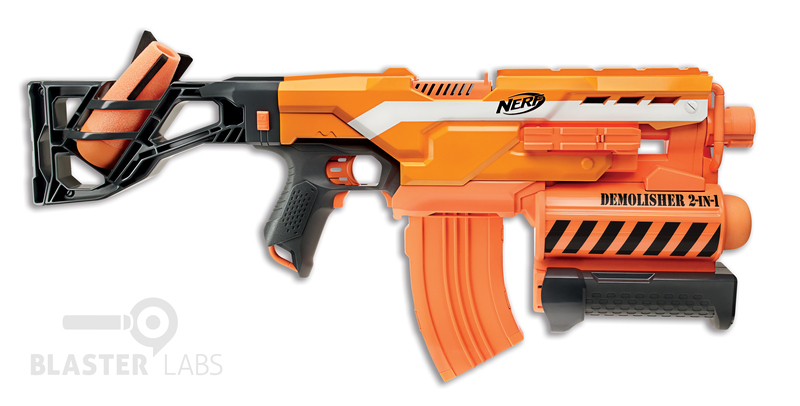 Top-mount jam door is similar to the Stryfe and Rayven which, along with the semi-auto functionality and battery compliment, indicates the internal workings may be very similar to Stryfe-style flywheel blasters. Two tactical rails are provided—one on the right side, plus one on the top. Hasbro hints at “scopes and lights” to become available. Front-mounted “grenade launcher” is an integral (non-removable) part of the blaster. It is air-powered, with a single forward motion to prime and a pull-back motion to fire. It reportedly emits an auditory “pop” when fired. Solid foam “Mega darts” have angled fins, creating a stabilizing spiral motion in flight. 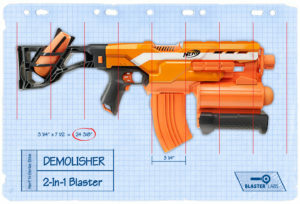 Removable shoulder stock holds a single “Mega dart,” with initial reports from UK Nerf indicate that it holds the dart somewhat loosely, and the exposed end of the dart interferes with aiming. Two strap points are provided—one near the muzzle, and one on the underside of the handle. Barrel extensions are reportedly compatible, though the current design appears to discourage those additions, aesthetically speaking. 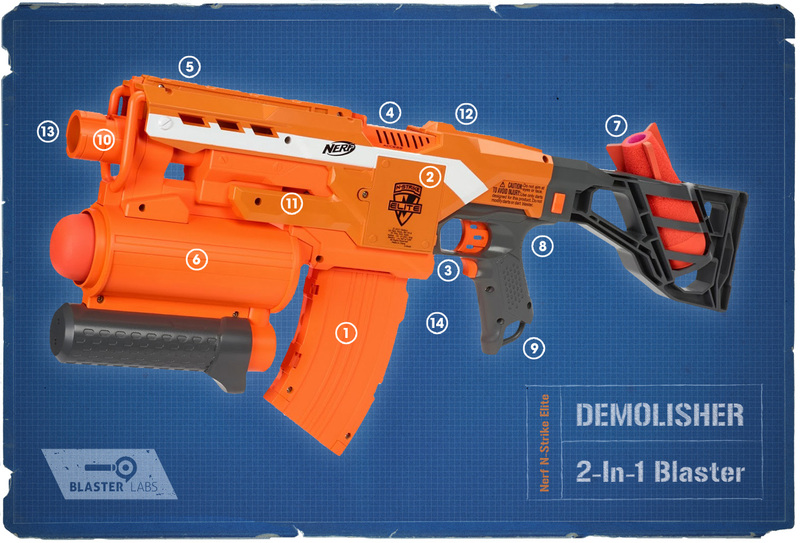 Body color appears to be predominantly blaze orange, in keeping with the “OJ Stryfe” that has already been spotted. A new, striped pattern on the “grenade launcher” along with the words “Demolisher 2-In-1 has been added since the initial reveal. We estimate the overall length to be approximately 24.5 inches, assuming a 3.5” ammo clip. Retail price was announced to be $39.99 in the U.S., with a fall, 2014 release. All told, we’re feeling very good about this blaster. Shot distances, if true, will be exceptional, the rate-of-fire should be comparable with the current flywheel-based models (a good thing), and the “Mega dart” grenade launcher will add interesting play elements. Our primary concerns center around the meager, 10-dart “faux” banana clip, and the fact that this blaster will likely be very front-heavy, which will make our dual-wield dreams fairly short-lived. Still, the “tacticool” feel of this one is spot-on, and definitely the right direction for the brand. We can’t wait to get some hands-on time at Toy Fair ’14 in February! This entry was posted in Dart Blasters and tagged demolisher, n-strike, nerf on January 30, 2014 by PMindemann.